When you are with your partner how do you get the consensus to watch a movie? As for us, hubby will always go to check on the rating in IMDB.com. This time, he played a trick. He knew that I like cartoon and there is one coming out: The fog and the kid. He hid this cartoon and instead told me that there were two good movies, American Gangster or another police movie, both sounded "guy"'s movie to me. 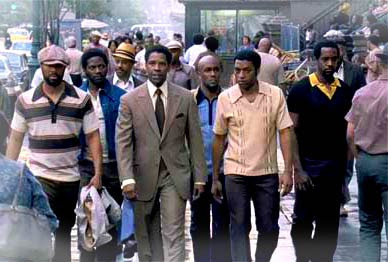 At the end we both agreed to try out American Gangster since it has very good review. If you have chance, go see this movie. Ya, agree with you this is a good movie. heard alot bout this movie. yet to watch it though. I have two close friends in this movie and I refused to go see it. It's one of the things I hated about living in the US. personally it wouldn't have been a movie of my choice, preferring all the romantic chick flicks/comedies but hubby just started watching it on his PC and I ended up following after a while and got hooked to the end! Very glad I tuned in!